One of the benefits of being in Vichy, France this past weekend was that I got to watch and support the athletes taking part in Sunday's Ironman Vichy. Set in the "Queen of Spa Towns" with a run course on the shores of the Lac d'Allier, which also provided the swim course, it was a tough day for everyone with temperatures rising to around 35°c. Those temperatures, along with a stiff breeze on the second loop of the bike course, were not enough to stop the incredible and inspirational Eddie Brocklesby. 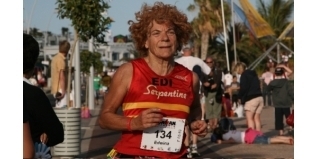 In 2013, at 70 years of age, Eddie became the oldest British female to complete an Ironman when she finished Ironman Lanzarote in 16:43:39. Eddie, Eddie, Eddie... Oi! Oi! Oi! 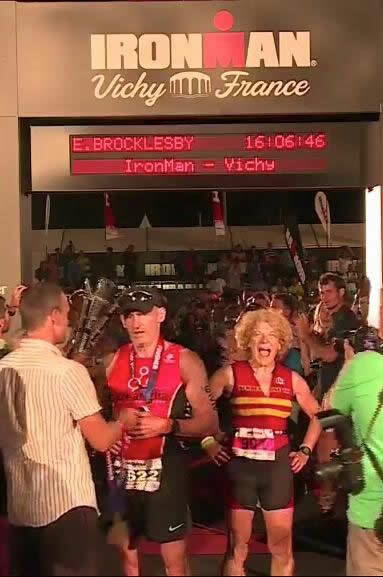 Another Ironman completed, this time at 72 years old for a woman who didn't even start running until she was 50 and could barely swim a width of (bad) breaststroke. The Coach: "She's a bloody legend"
Eddie is coached by former Elite athlete and now BBC Commentator Annie Emmerson, who told me "She's a bloody legend! She trains hard, but she also has a lot of demands on her time with work and being a Grandmother. She often has to drop things for other responsibilities which means missing out on training. The turnaround in her thinking after having to pull out of Ironman Lanzarote earlier in the year was impressive... initially she was talking about that being the last one, then a few days later I'm getting emails about Ironman Vichy! Eddie is so passionate about getting the over-50's into activity and exercise at whatever level that may be. She runs the Silverfit charity (www.silverfit.co.uk), and is always setting up these exercise groups in parks all over London to get people active. While she is passionate about sport, she's not one to miss out on the social aspect either! I don't know anyone else who gets by on less sleep - she'll be busy working all day, then out partying until late... then swimming in the Serpentine at 6:30am. Quite incredible, a real inspiration."